The astonishingly prolific child prodigy Elisabeth Kulmann (1808–1825) was born into the large German-speaking community living in Russia; she died at the age of seventeen having penned many thousands of verses in Russian, German and Italian. Schumann, who had visited Russia in 1844, took up her cause as soon as he came into possession of the sixth edition of her poetry that was published in Frankfurt in 1851. He seems to have felt it was somehow his urgent responsibility to make the German public aware of Kulmann’s qualities. The composer set seven songs for solo voice, Op 104, ‘in memory of the poet’; for these he wrote biographical commentaries as headings for each song, placing each setting within the context of Kulmann’s life. There is a note on this cycle (as well as the poet) in the booklet accompanying Volume 3 of the Schumann Hyperion Edition. At the same time he was working on the duets recorded here. While admitting that Schumann’s late style has its revelatory moments and its masterpieces, we cannot help but look back ruefully to the great song composing year, only eleven years earlier. Indeed, we seem decades away from the period when Schumann’s music was effortlessly allied with the greatest poets of the age like Heine and Eichendorff where there was no need for this kind of special pleading. In 1849, it is true, he had written a cycle in memory of the poet Lenau, but in that case there was a real case to be made for the poet’s importance, and Schumann’s songs did much to bring this verse to the attention of musicians. The first two poems set in Op 103 were taken from a massive sub-section of Kulmann’s verse poetry entitled Gemäldesammlung in vierundzwanzig Sälen (‘Collection of pictures in twenty-four galleries’) written between 1819 and 1820. The poems for the third and fourth duets are from another Gemäldesammlung, this time arranged in twenty ‘galleries’. 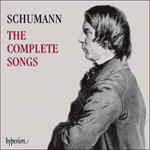 Schumann ploughed his way, it seems, through hundreds of pages of printed verse in a remarkably substantial and heavy tome in order to pinpoint the lyrics he believed suitable for musical setting. One cannot help feeling that there was an quixotic, even obsessive, side to this quest that stemmed from the composer’s increasingly disturbed psychological state. Schumann seems to be continuing here in the style of the Liederalbum für die Jugend Op 79—which is to say that the music itself is unchallenging to the ear and has a sweet innocence about it (no doubt because Kulmann herself was a child when she wrote the poems). Schumann seems to have abandoned his penchant for making two voices compete with each other in enunciating different parts of the text at different times—this had resulted in a rich contrapuntal weave in many of the earlier duets. In these Kulmann settings, on the other hand, there is little that Mendelssohn would have found surprising, but quite a bit he may have found awkward. If Schumann had envisaged these songs being sung by children he would have searched in vain for two youngsters capable of singing them sufficiently well. Whenever music is self-consciously simple like this it is inevitably also more exposed; there are challenges here of intonation and breath control that need professional experience, particularly in the slower songs. Cette fois, il n’y a pas de texte parlé, mais le même style perdure—une grande naïveté musicale comme si Schumann voulait nous faire comprendre que Kulmann était à la fois brillante et enfantine. Deux duos pleins d’entrain (Mailied et An die Nachtigall) se mêlent à deux duos plus rêveurs—Frühlingslied et An den Abendstern, ce dernier étant un morceau de musique calme et intense sur un thème littéraire qui avait sûrement marqué Schumann lorsqu’il avait entendu pour la première fois l’Hymne à Vénus et la Romance à l’étoile de Wolfram dans Tannhäuser de Wagner. Diesmal gibt es keine gesprochenen Übergänge, doch der Stil wird beibehalten, eine sorgsam zur Schau gestellte musikalische Naivität, als wolle Schumann uns zu verstehen geben, dass Kulmann gleichzeitig brillant und kindlich war. Zwei lebhafte Duette (Mailied und An die Nachtigall) sind mit den beiden verträumteren Liedern Frühlingslied und An den Abendstern verwoben, letzteres ein ruhiges, besinnliches Stück Musik für ein literarisches Thema, von dem Schumann zweifellos beim ersten Hören von Wolframs Hymne an den Abendstern in Wagners Tannhäuser eingenommen wurde. Der Greis aus seiner Ruh. Looks on as children play. An die Nachtigall (Frisch, C major) is another merry song, and it is clear that the composer has planned a shape to the opus where fast songs alternate with slow. There is a charming off-the-beat lilt to the accompaniment, and the asymmetrical lengths of phrase (the duet opens with a five-bar melody) give the music winsome charm. Schumann leaves out the third of Kulmann’s five verses. For the first and second and last of these he constructs an extended pedal point on C for nine bars; this permits a shift into the dominant only at the strophe’s closing cadence. This ‘hanging on’ is an effective tonal analogue for begging the nightingale to remain and not fly away—the kind of response to words that was effortlessly typical of Schumann in his earlier days. Kulmann’s original title is Kinderlied an die Nachtigall. Love to look at you. Has such a lovely raiment. There is no doubt that Schumann knew Wolfram’s aria ‘O du mein holder Abendstern’ from Wagner’s Tannhäuser. Indeed, at the very time that Schumann composed this duet, the opera was beginning to establish itself throughout Germany, no doubt to the considerable annoyance of composers who regarded Wagner as a rabble-rousing parvenu. Although Schumann did not approve of Wagner, his erstwhile Dresden colleague, the very mention of the word ‘Abendstern’ at this time must have betokened a set-piece aria of considerable beauty (for this was surely the most accessible music in that opera for early audiences). Is this what drew the composer to Kulmann’s poem entitled Kinderlied an den Abendstern? Schumann accordingly delivers what must be considered the most beautiful song in this set (Langsam, A flat major). A gentle triplet accompaniment supports a vocal line of radiant purity, a prayer in music with all of Schumann’s ‘innig’ qualities. As if to express his disapproval of Wagner’s chromaticism, Schumann confines himself to the minimum of harmonic change and manages to spin music of a rapt luminosity out of Kulmann’s rather ordinary words. In this, his farewell to the writing of vocal duets with piano, Schumann manages something that is typical of his genius, and worthy of it too.